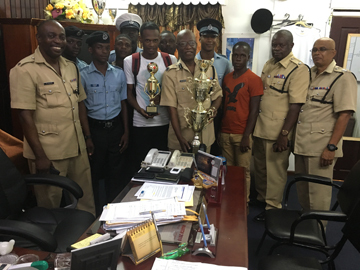 Members of the ‘A’ Division Football team and senior officers, including Commander Marlon Chapman (centre with trophy), display the spoils for their effort. the Police Sport Club Ground, Eve Leary in the Police Inter-Divisional competition. (5) a side football final atthe Police Sport Club Ground, Eve Leary in the Police Inter-Divisional competition. ‘A’ Division came out comfortable winners after beating the ‘Music Boys’ 3-0, as they collected the championship Trophy and one hundred ($100,000) thousand dollars prize. The captain, Constable Marvin Josiah was adjudged the Most Valuable Player (MVP) and was awarded with a trophy and seven thousand dollars ($7,000) for his efforts. Commander ‘A’ Division, Assistant Commissioner Mr. Marlon Chapman along with Second-in-Charge ‘A’ Division, Senior Superintendent Rishi Das, and Third-in-Charge ‘A’ Division, Superintendent Walter Stanton and other ranks met with the players at his Brickdam Office Thursday last, and congratulated them for their exceptional performance.